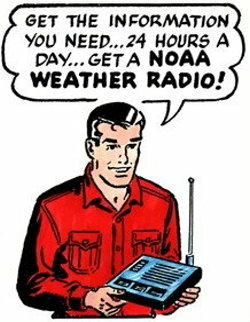 NOAA Weather Radio All-Hazards (NWR) is the "voice of the National Weather Service" and serves as the agency's primary means of communicating around-the-clock weather information to the public. NWR is a nationwide network of over 1000 transmitters broadcasting continuous weather updates directly from the nearest National Weather Service office. Each transmitter broadcasts official National Weather Service forecasts, weather watches and warnings, special statements, and current weather conditions for a specific area. Generally repeated every 4 to 10 minutes, the broadcast cycle is routinely updated every 1 to 3 hours (or more frequently if the weather dictates). During severe weather, routine weather broadcasts can be interrupted to highlight special warning messages concerning imminent threats to life and property. Working with the Federal Communication Commission's Emergency Alert System (EAS), NWR is an "All Hazards" radio network, making it your single source of comprehensive weather and emergency information. In conjunction with federal, state, and local emergency management and other public officials, NWR can also broadcast information about non-weather hazards, such as earthquakes, chemical or oil spills, AMBER alerts, and 911 telephone outages. NWR is the only federally operated system that broadcasts weather and emergency warnings to the public. NOAA Weather Radio broadcasts heard across southeast Indiana, northern Kentucky, and central/southwest Ohio originate from the National Weather Service in Wilmington, Ohio. Each of our transmitters broadcasts official National Weather Service forecasts, weather watches and warnings, special statements, and current weather conditions for a specific area. Generally repeated every 4 to 10 minutes, the broadcast cycle is routinely updated every 1 to 3 hours (or more frequently if the weather dictates). During severe weather, routine broadcasts can be interrupted to highlight special warning messages concerning imminent threats to life and property. What types of weather information is available on NOAA Weather Radio? Watches and warnings for severe thunderstorms, tornadoes, floods, strong winds, winter weather, etc. 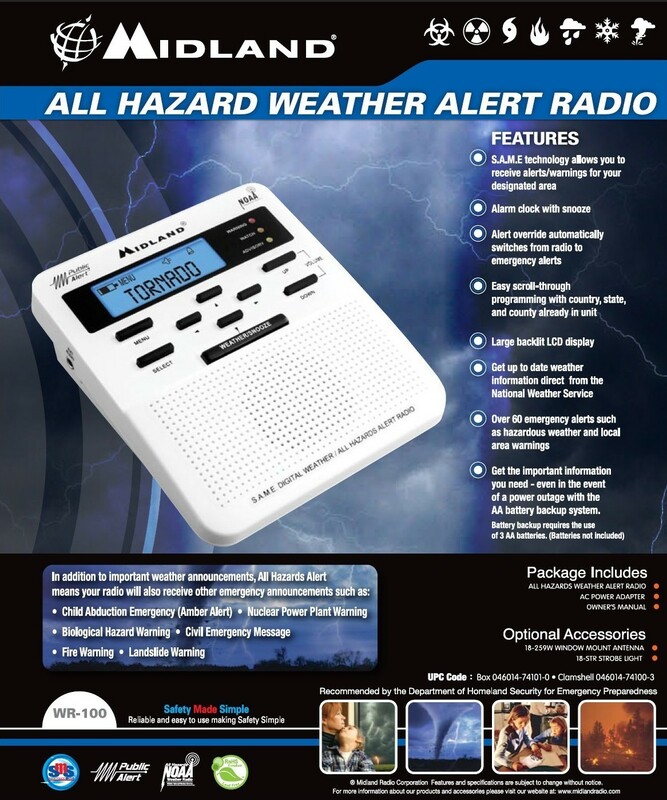 What NWS products will activate the alarm on my NOAA Weather Radio receiver? What non-weather emergency products will activate the alarm on my NOAA Weather Radio receiver?